Every busy day should start with a good breakfast, especially when the day is jam-packed with the many fun-filled activities of the Cobourg Waterfront Festival. Get a taste of Northumberland County with fresh, local strawberries and real Maple Syrup served with fluffy pancakes and barbequed sausages! 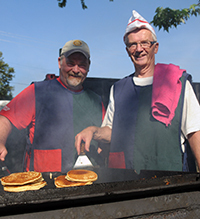 Come tantalize the taste buds and tame the tummy as volunteers from the local business community don chef hats and aprons and serve up breakfast, Cobourg-style near the bandshell. $1 off all breakfasts served prior to 8:30 a.m.
Victoria Park, beside the bandshell.